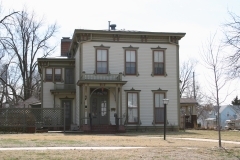 The McKinley Residential Historic District is comprised of 142 properties located in Newton. Of the 142 properties in the district, there are 138 single-family and multi-family dwellings, one church, one school, two buildings associated with a historic hospital complex, and one clinic. 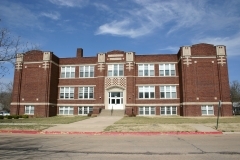 Because of the neighborhood's vicinity to downtown Newton, schools, and the district offices of the Atchison, Topeka and Santa Fe Railroad, it was a highly desirable location for the city's middle- and upper-middle-class residents from the time of Newton's founding in the early 1870s through the 1920s. The properties represent a wide range of architectural styles including Italianate, Folk Victorian, Gothic Revival, Queen Anne, Prairie, Bungalow, Tudor Revival, Colonial Revival, and Minimal Traditional. The district is nominated for its reflection of community growth and development and popular architectural trends. 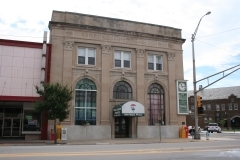 200 through 214 and 203 through 301 N. Main St.
411-825 N. Main St. and 414-726 N. Main St. 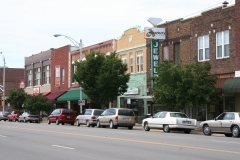 The Sedgwick Downtown Historic District encompasses the majority of the west side of the 500 block of North Commercial Avenue in Sedgwick. 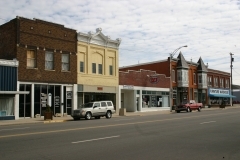 The oldest town in Harvey County, Sedgwick is located 16 miles southwest of Newton, the county seat. 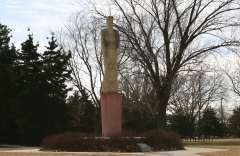 The town was sited at the junction of the Little Arkansas River and Sand Creek, and is located on a Santa Fe Railroad spur line that stretches north from Wichita to connect to the main Santa Fe line in Newton. There are 11 buildings in this district built between 1880 and 1930 representing several phases of development. 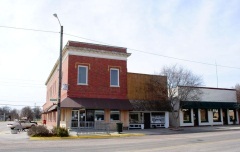 The earliest building is a wood-frame false-front building that was moved to the downtown in 1880. 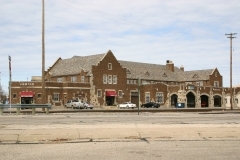 Some buildings were built or modified following a devastating tornado in 1923, and others, like the Sedgwick State Bank, were updated after World War II when Sedgwick experienced a population boom of aircraft workers who were employed at Wichita’s Boeing and Cessna plants. 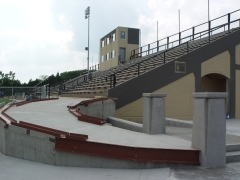 The district is nominated for its association with the growth development of Sedgwick.